Regular readers of this blog will know that I’ve recently taken part in Stoptober and managed to give up smoking. Starting smoking is an easy thing to do, but it’s a very difficult thing to stop and to make that stop permanent. The easiest way to make it a permanent stop is to never start in the first place. One of the things I hated most about starting smoking again this year was (although I didn’t smoke in the house, nor in front of my boy) that I didn’t want him to see me smoking as a normal or accepted thing for us to do. My parents smoked like troopers while I was growing up and made it seem very normal. Children should never see it as normal or accepted behaviour. Lots of people very kindly followed my progress and amongst those were the good people at Cancer Research UK. They’ve asked if I’d highlight their latest campaign on my blog which I am very happy to do. On Monday 11th November Cancer Research UK launched a new film to support their ongoing campaign for standardised tobacco packaging products. Every year in the UK 207,000 11-15 year olds take up smoking – that’s 570 children every day! Addiction keeps them smoking into adulthood, where it then kills one in two long-term users. Since tobacco advertising became illegal in the UK in 2002, tobacco companies have invested a fortune in branded packaging to attract new smokers. Most of these new smokers are children, with more than 80% of smokers starting by the age of 19. The Cancer Research UK video showing how children respond to branded cigarette packs gives you an idea of how powerful this glamorous tobacco packaging can be http://www.cruk.org/standard-packs. There is strong evidence that removing glitzy designs from cigarette packs makes them less attractive to children. 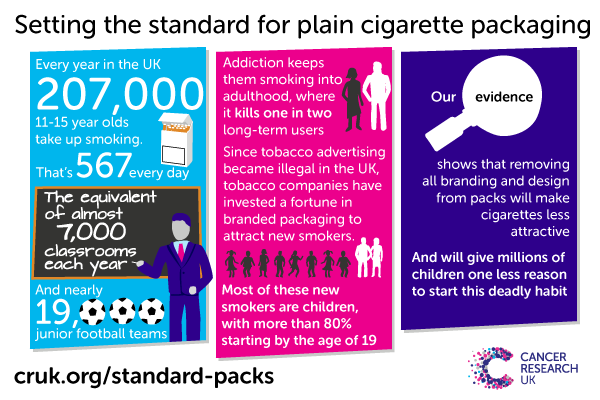 Plain, standardised packaging won’t stop everyone from smoking – but it will give millions of children one less reason to start. What does ‘standardised packaging’ actually mean? This entry was posted in Children, Health and tagged Cancer Research UK, smoking, Smoking cessation, Standardised Packaging Campaign. Bookmark the permalink.